Day went off so fast, though I did lot of work in terms of being productive. Missed having my lemon juice today and included par boiled Cabbage for lunch. Cabbage is supposed to be very good while on diet, though this is not advised for people with hypothyroid. It suited me very well and I used to have this par boiled every day and it was also part of the soup. The way I do it is very simple, add little water, steam cook it in sim for 5 - 7 mins. The cabbage has to be crunchy. Here's my 4thd day schedule. 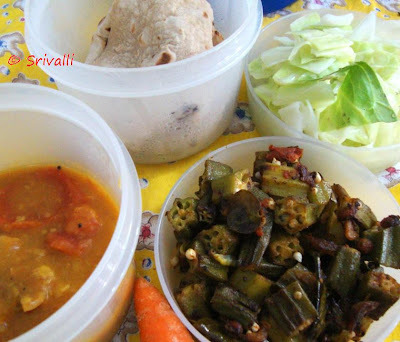 1.15 pm - 2 pulkas, Radish Sambar, Lady's Finger Stir Fry, Cabbage Salad, Buttermilk. See that long gap, I was sipping lot of water in between, was not feeling hungry at all!